I’m wrapping up S’Mores week with one final chocolate/marshmallow/graham cracker treat. 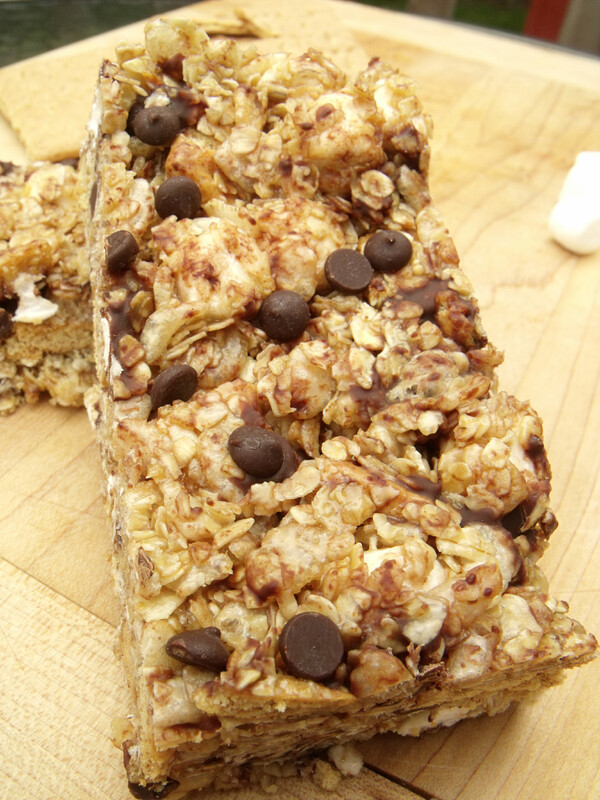 These S’Mores granola bars are perfect for picnics or summer day trips. Though I don’t want to think about it, the school year is right around the corner (I know many American schools are already back in session!) 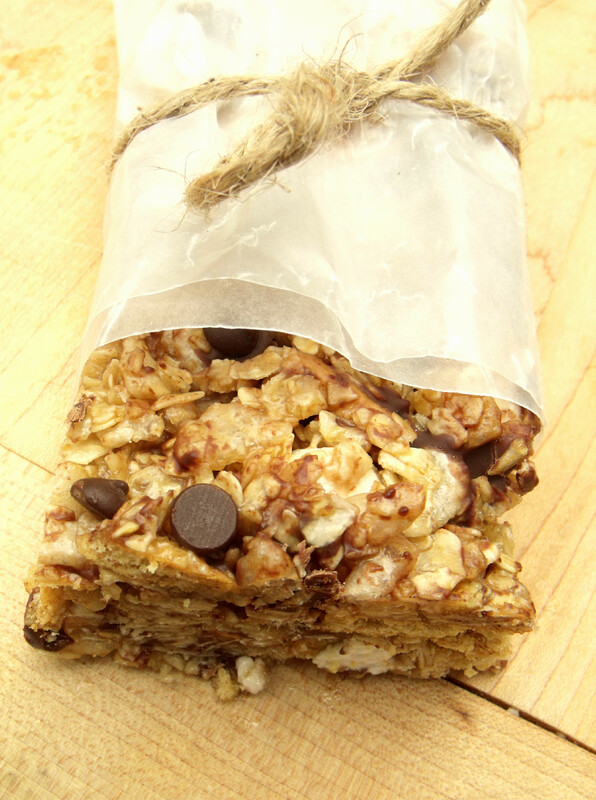 and these bars are great in lunch boxes too. I don’t buy too many packaged foods, but granola bars are an occasional indulgence. My husband loves the Quaker Chewy S’mores bars and the Golden Grahams granola bars, so I set out to make a homemade version. They’re still more of a treat than a healthy snack, but certainly less processed than the store-bought version. They’re nut free and can easily be made gluten and dairy free, traits that can be difficult to find in a commercial granola bar. 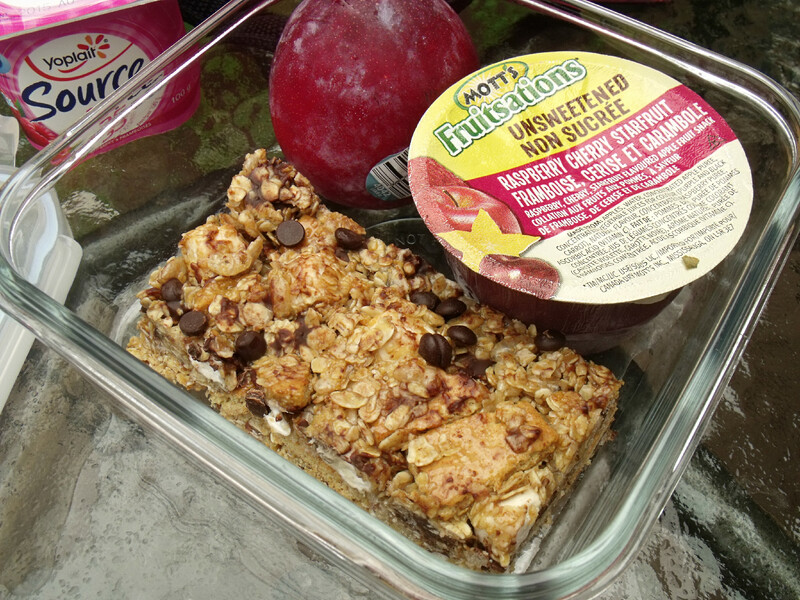 The granola bar base, from Two Peas and Their Pod, is super versatile and works well with sorts of add-ins. I love Maria’s Peanut Butter Pretzel version! Graham crackers, marshmallows and chocolate chips make these s’more inspired, but you could add all kinds of things. You’ll need butter or margarine (Earth Balance works well to keep them dairy-free), honey, brown sugar and vanilla for the sticky part. 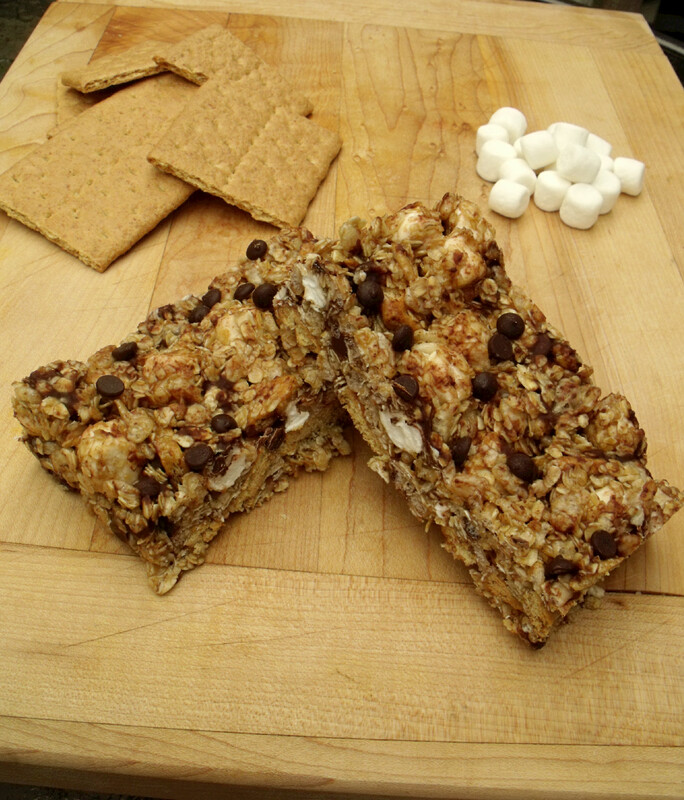 Quick oats, Rice Krispies, graham crackers, mini-marshmallows and mini-chocolate chips round out the ingredients. To keep the bars gluten-free, choose oats that are certified gluten-free, along with gluten-free Rice Krispies (they happened to be the only Rice Krispies I had on hand) and graham crackers. Crush or chop up the graham crackers. You don’t want to pulverize them into crumbs, aim for about 1 inch chunks. 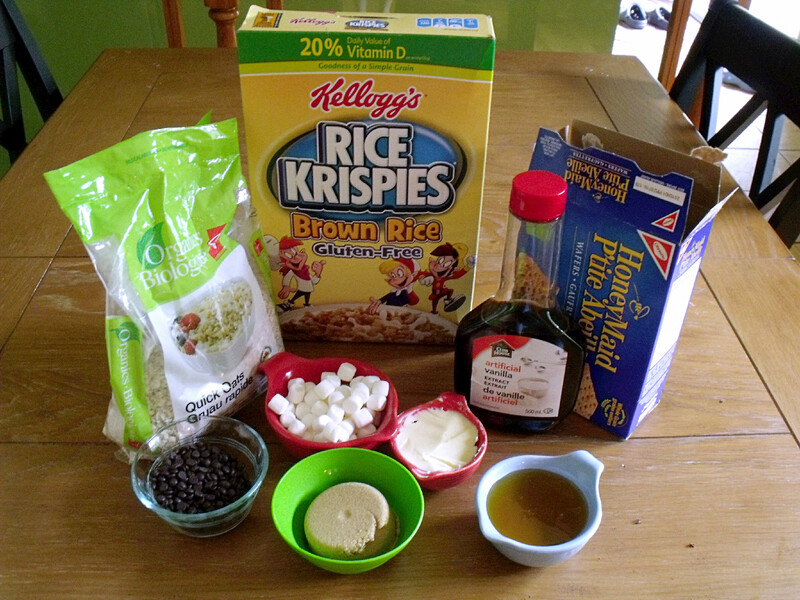 Combine the graham crackers, oats and Rice Krispies in a large bowl. 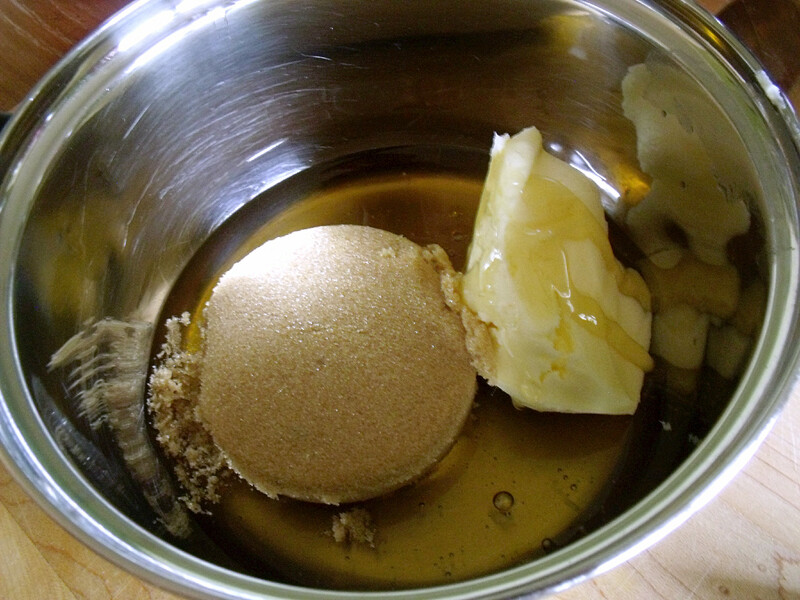 Place the butter, honey and sugar in a small pot over medium heat. Bring it to a boil, then lower the heat and simmer for about 2 minutes, until it measures 234° on a candy thermometer (soft ball stage.) 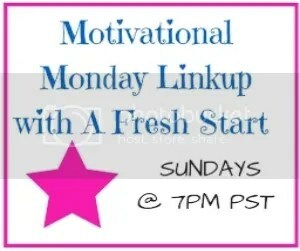 It really does only take a minute or two, so stay close! Add the vanilla and set the mixture aside to cool for about 5 minutes. Once the syrup has cooled a bit, pour it over the dry ingredients and mix with a large spoon or spatula until evenly coated. Give it another few minutes to cool, as you don’t want to melt the chocolate and marshmallows. Add the chocolate chips and marshmallows and mix gently until they are evenly distributed. Try not to mix too much or they will start to melt! You can use regular chocolate chips if necessary, but the I like the minis for granola bars since they distribute more evenly. I use Enjoy Life brand to keep them dairy free. Press the mixture into a greased 8 x 8 or 9 x 9 inch pan. You can see that I was a bit impatient, my chocolate chips are melting a little. 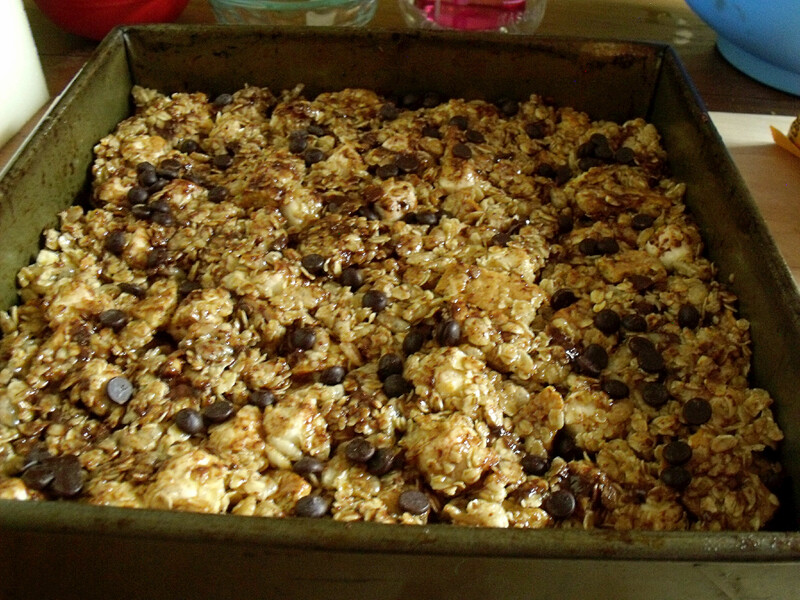 Cool for at least 30 minutes and cut into squares or bars. Store the bars in an airtight container in the fridge. Sometimes I’ll individually wrap them in foil or plastic wrap to make them easier to grab and go. They’re perfect to pack for a summer picnic or school lunch box! The honey flavour really shines through, especially if you use a good local honey. 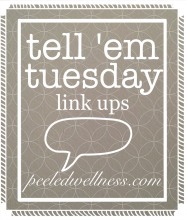 I’m pondering a few different granola bar variations…maybe dark chocolate almond cranberry!? Now I think it’s time to wrap up all of the S’mores baking with some classic ones! Time to round up some little cousins and have a campfire! 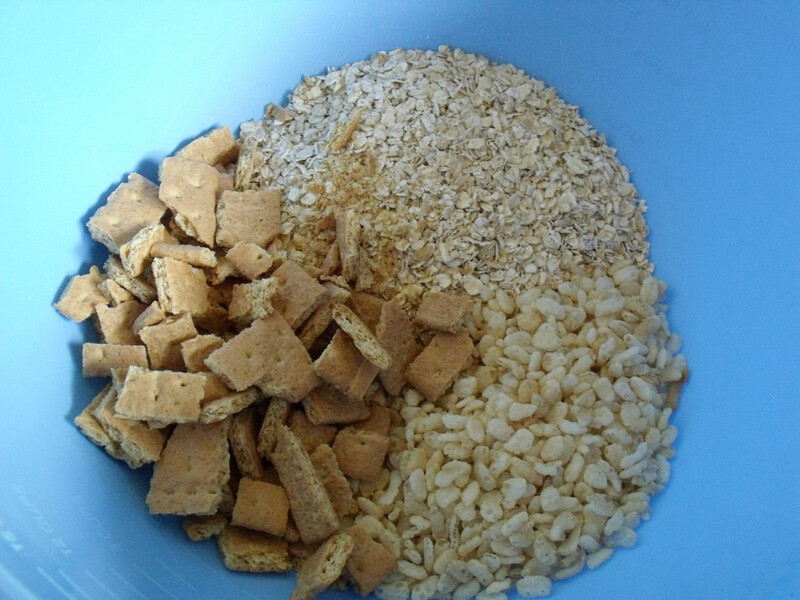 Combine the chopped graham crackers, oats and Rice Krispies in a large bowl. 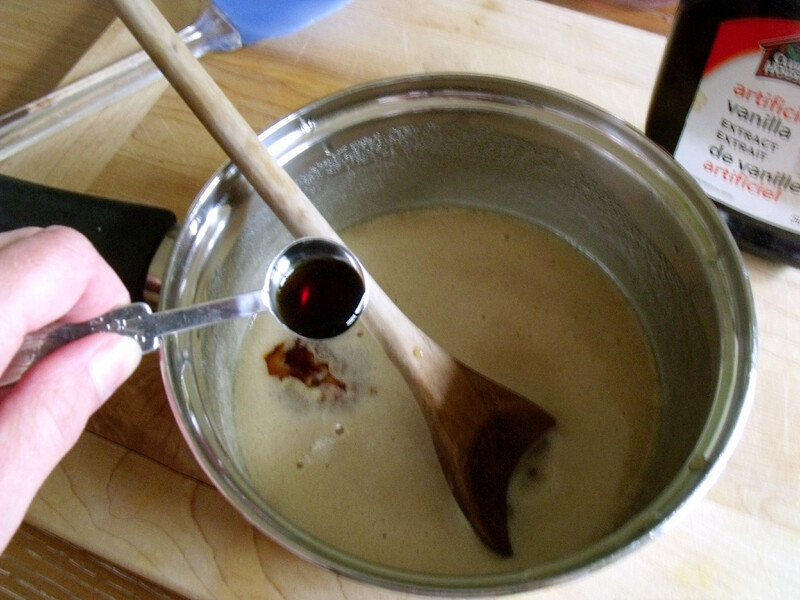 Once the syrup has cooled a bit, pour it over the dry ingredients and mix with a large spoon or spatula until evenly coated. 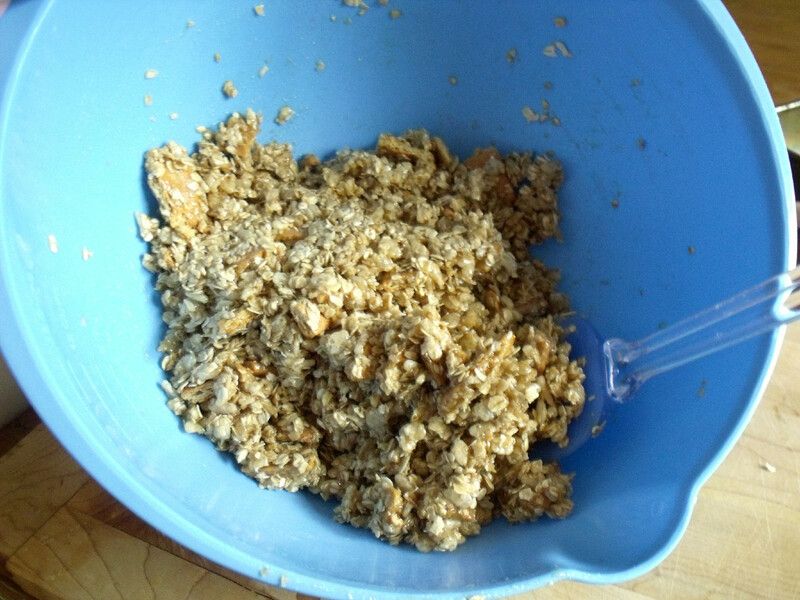 Allow the mixture to cool for another few minutes. 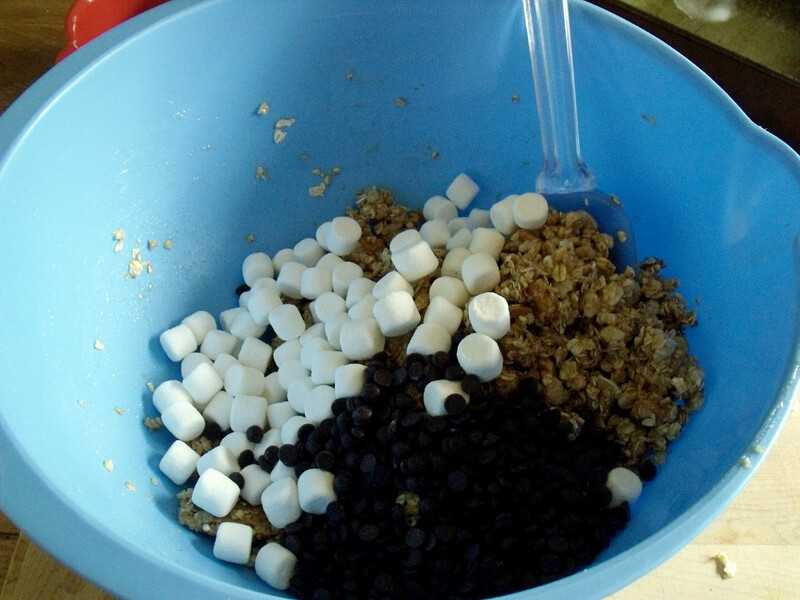 Add the chocolate chips and marshmallows and mix gently until they are evenly distributed. 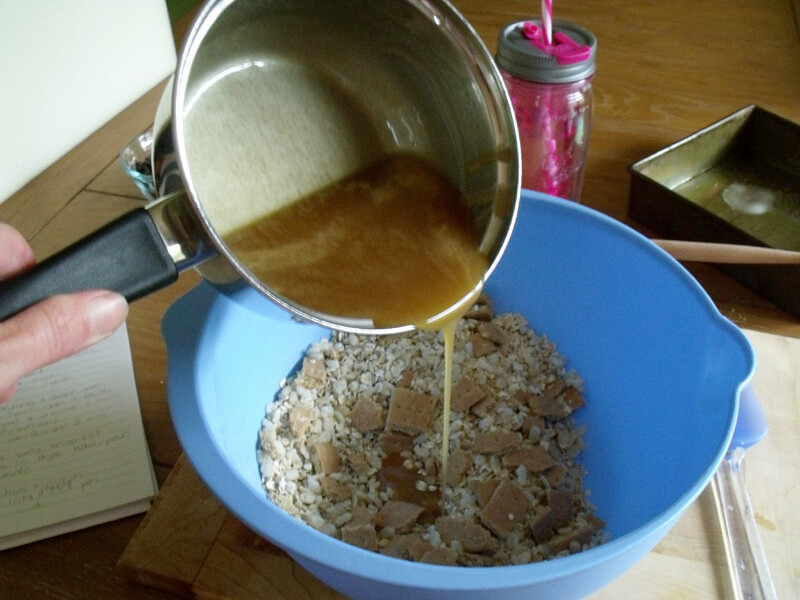 Press the mixture into a greased 8 x 8 or 9 x 9 inch pan. . Cool and cut into squares or bars. 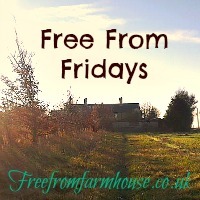 Store in the fridge, in an airtight container, or wrap individual bars in plastic wrap or foil. These bars are easily adaptable for gluten-free, dairy-free or even vegan diets (sub in agave nectar for honey and use vegan marshmallows.) Be sure to read labels and check that your ingredients are free of allergens before making these bars for someone with a food concern. 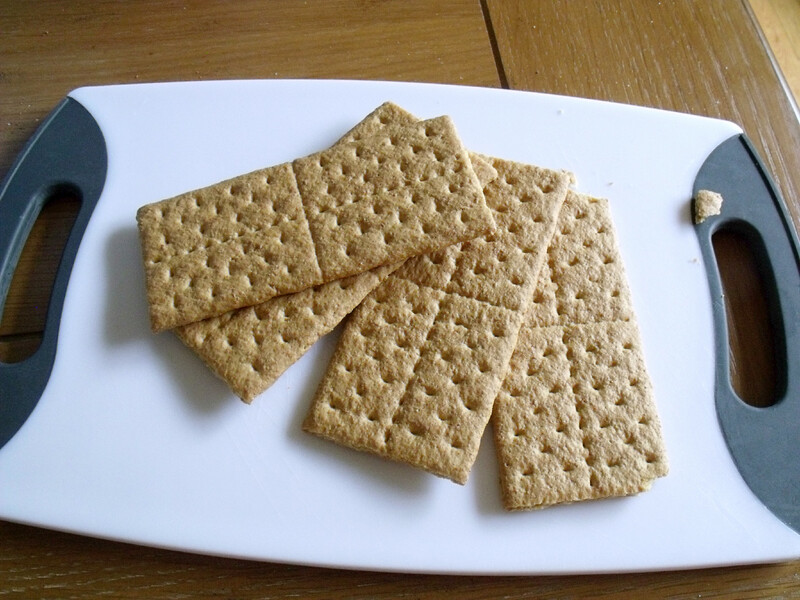 It’s on my list to eventually develop a good healthy graham cracker recipe. It’ll be here when I do!